Are you over the age of age of 50 or know anyone 50+ who would benefit from being out and about more? Feeling lonely or isolated and looking for an opportunity to re-engage with your community and meet new people? Our community partner Ambition, Aspire, Achieve, have started a fabulous project aimed at providing those aged 50 and over with an opportunity to combat loneliness by engaging in social interaction with others in a safe, friendly environment. 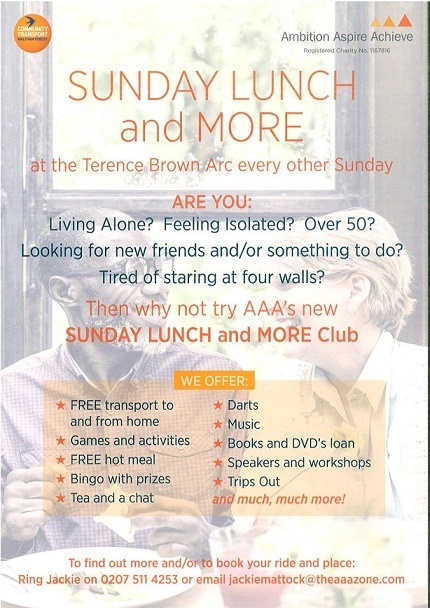 They will be hosting Sunday Lunches at the ‘Terence Brown Arc’ in Newham where attendees can enjoy a delicious hot meal and participate in various activities, enjoy guest speakers all while making new friends. Please help us spread the word of this opportunity by passing the information on to any individuals that would benefit from an opportunity like this; for further information please contact Jackie on 0207 511 4253 or email jackiemattock@theaaazone.com. We have been busy at Community Transport, so busy that we can’t believe we are in the month of March already! How did January and February go past so quickly??? 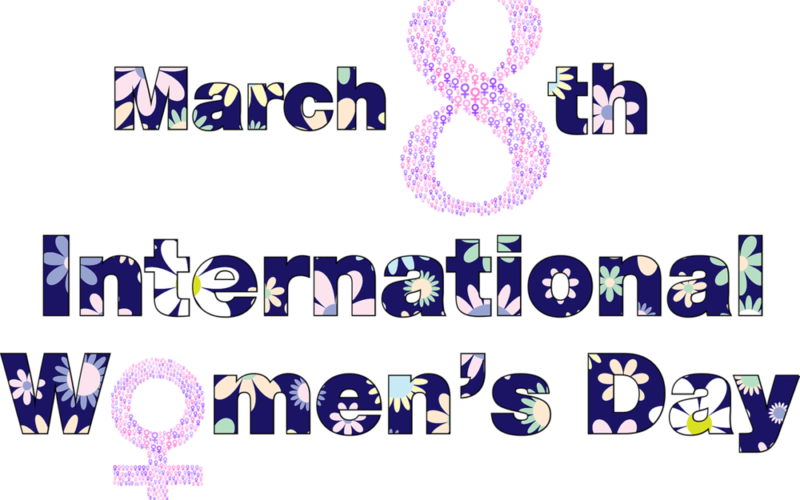 Anyway, busy or not there is now way we could let today come and not take the time to wish every one of the amazing women on our team Happy International Women’s Day! 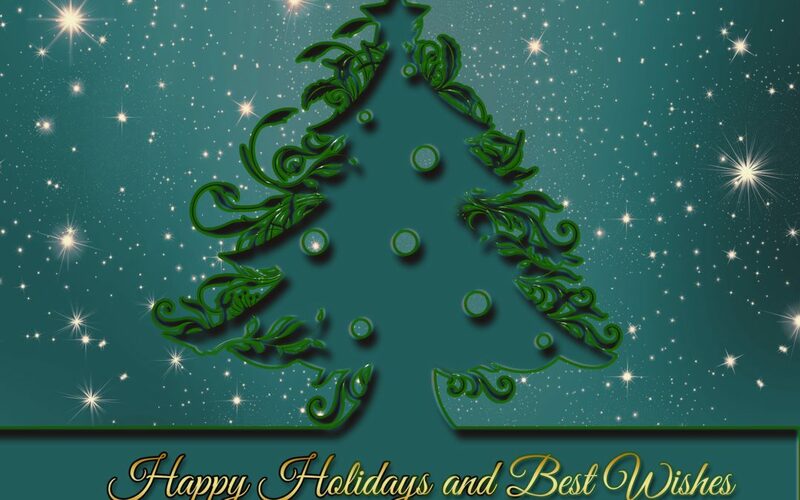 Community Transport Waltham Forest wishes everyone a Merry Christmas and a Happy 2018! We look forward to working with all of our partners in Waltham Forest & Newham to continue to build and grow our communities. The Festive season is almost here and we at Community Transport have planned a variety of trip options for our Excursion Club Members in Waltham Forest & Newham. 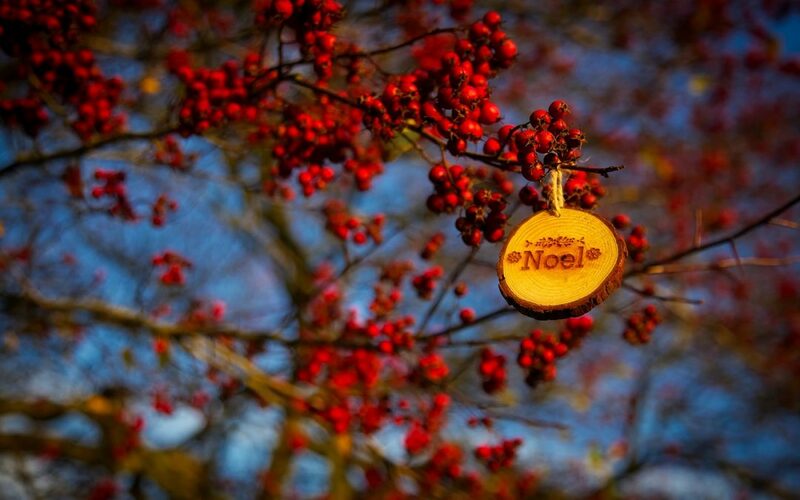 From enjoying a day of shopping at numerous out of borough Garden Centres to exploring the city’s renowned museums and evening tours of the amazing Lights displays; we have done our best to ensure the elderly in both boroughs have options to feel part of the Festive spirit and remain active in their communities. Becoming a part of this service is easy, simply complete and return our membership form which can be found here for Waltham Forest residents and for those in Newham you can request a form by contacting us on 0208 521 0665 or email info@ctwf.co.uk. Ahhh memories of summer, hard to believe it only just ended as it feels so long ago 🙁 . We at Community Transport have been so very busy these last few months that it is hard to know where to start with all that has been achieved; anyway continue reading for highlights of the top events. You may recall our previous stories of the amazing fundraising feats our staff completed to provide under privileged children with memorable summer memories. We spoke about it here and here and their valiant efforts were not in vain as we were able to treat over 200 children from Waltham Forest and Newham to a fully catered day out at Southend on Sea; this included transport to and from each respective borough, full access to the Adventure Island, Sea Life Aquarium and a tasty lunch of fish n chips, drink and ice cream. This is the second year we have staged this event and the reactions and feedback from the participants still give a ‘zing’ to the heart and smile to your cheeks :). Click these links BDOcard_1 BDOcard_2 to view a snippet of the comments received. 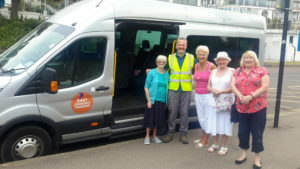 Our Excursion Club expanded this summer and we were able to extend the service to residents in Newham. 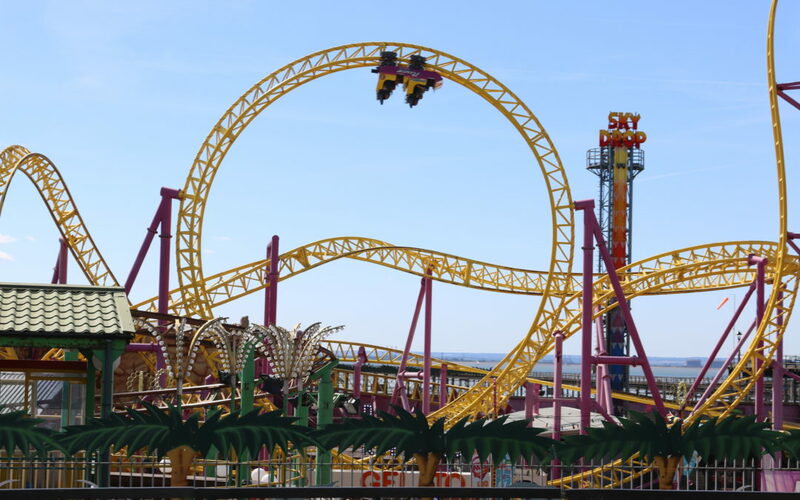 This season members from both boroughs had the opportunity to visit Southend on Sea, Polhill Garden Centre, The Hop Farm & Teapot Island as well as enjoy Myddleton Gardens. Membership within Waltham Forest continues to grow and our initial launch in Newham this summer indicates that a service such as this will provide a welcome outlet to tackle the ambit of loneliness and social isolation among the elderly and disabled. And finally the most exciting event to happen for us this summer (drum roll please)…Community Transport Waltham Forest has become a sub-contractor for TfL’s Dial-a-Ride services in the boroughs of Waltham Forest and Newham!!!! What exactly does this mean? Well the protocol for joining Dial-A-Ride remains the same with contact being made directly to Dial-A-Ride for bookings and membership, however, Community Transport will now execute service delivery within the boroughs on behalf of Dial-A-Ride. 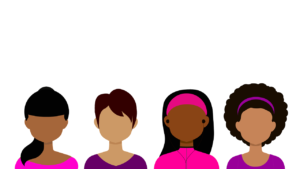 We are currently in the planning stages of offering more events for to benefit and uplift the Community and Excursion club side of our operations so stay tuned to our newsletter, Facebook and Twitter for updates.